Cecil Chubb was born in Shrewton, a village 4 miles (6.4 km) west of Stonehenge, the eldest son of Alfred and Mary Chubb. His father, "Fred", was the village saddler and harness maker, as was his father before him. Cecil attended the local village school and then the Bishop Wordsworth's School in Salisbury, where from the age of 14 he worked for a time as a student teacher. Chubb met his future wife at a cricket game between his Bishop Wordsworth School and Fisherton House Asylum. He then attended Christ's College, Cambridge where he was awarded a double first in Science and Law, leaving with Master of Arts and Bachelor of Law degrees. Chubb became a barrister and amassed a considerable fortune. In 1902 he married Mary Bella Alice Finch, whose uncle, Dr W. Corbin Finch, owned Fisherton House, which was a mental asylum (later the Old Manor Hospital, now Fountain Way). Five years after her uncle's death in 1905, the business and buildings were transferred to her. Following financial difficulties, a limited company was formed to run the hospital in 1924, and Sir Cecil became chairman. Whilst he was in charge, the hospital became the largest private mental hospital in Europe. There is a plaque in the hospital commemorating his life and work. Sir Cecil also served on Salisbury City Council, was a Justice of the Peace and became a successful racehorse owner and breeder of Shorthorn cattle. Stonehenge was put up for auction in 1915 by the Antrobus family following the death in World War I of the only surviving male heir. Cecil Chubb's interest in the local area led to him attending the sale, with him bidding and purchasing Lot 15 on a whim for £6,600 (about £519,000/€613,000/$679,000 today), as he wished to avoid the stones being acquired by someone overseas. It is also speculated that he bought the stones as a present for his wife, only for her to be less than pleased with his new purchase. First that the public shall have free access to the premises hereby conveyed and every part thereof on the payment of such reasonable sum per head not exceeding one shilling for each visit and subject to such conditions as the Commissioners of Works in the exercise and execution of their statutory powers and duties may from time to time impose Secondly that the premises shall so far as possible be maintained in their present condition Thirdly that no building or erection other than a pay box similar to the Pay Box now standing on the premises shall be erected on any part of the premises within four hundred yards of The Milestone marked "Amesbury 2" on the northern frontage of the premises and Fourthly that the Commissioners of Works will at all times save harmless and keep indemnified the Donors and each of them their and each of their estates and effects from and against all proceedings costs claims and expenses on account of any breach or non-observance of the covenants by the Donors to the like or similar effect contained in the Conveyance of the premises to the Donors. Local residents are still entitled to free admission to Stonehenge because of a different agreement concerning the moving of a right of way. To mark his generosity he was made a baronet in 1919 by Lloyd George. Chubb's arms feature a trilithon representing Stonehenge. Chubb died of heart disease at his house (from 1930) in Bournemouth, Rothwell Dene, on 22 September 1934 aged 58, leaving behind his wife, son John, who succeeded him, and daughter Mary. 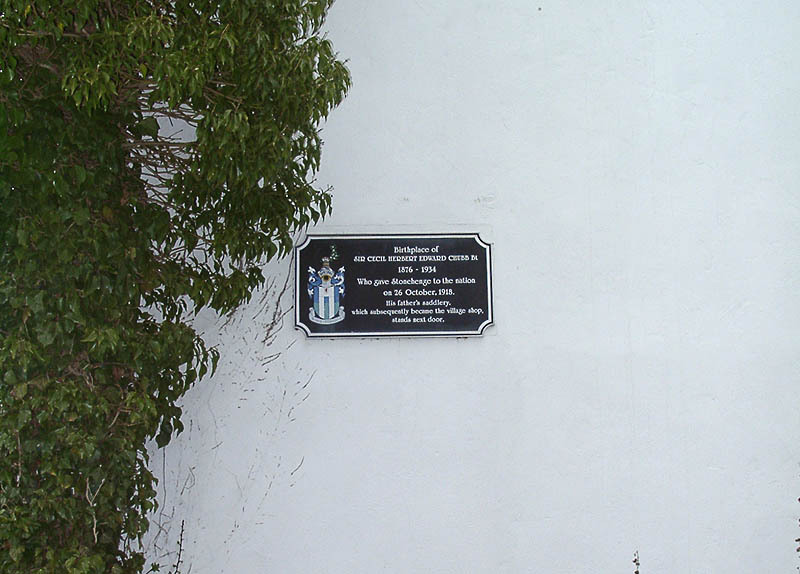 A plaque commemorating his birth was erected in the late 1980s on the house in Shrewton where he was born. It was unveiled by his two surviving nephews. ^ Parkinson, Justin (21 September 2015). "The man who bought Stonehenge – and then gave it away". BBC News Magazine. ^ "Stonehenge". This is Amesbury. Archived from the original on 25 June 2009. Retrieved 20 April 2007. ^ ḎḤWTY. "Cecil Chubb: The Man Who Bought Stonehenge". Ancient Origins. Retrieved 26 March 2018. ^ Daw, Timothy (3 December 2013). "Cecil Chubb's Deed of Gift of Stonehenge". Sarsen.org. ^ "No. 31587". The London Gazette. 7 October 1919. p. 12418. ^ "Milestones, Oct. 1, 1934". Time. 1 October 1934. Retrieved 12 March 2016. ^ "Plaque". Archived from the original on 11 October 2007. Smith, Gertrude "The Old Manor Hospital"
This page was last edited on 14 March 2019, at 00:16 (UTC).